Once it is determined that a candidate will be hired, it is important to log that hire on RecruitiFi. A candidate's total compensation number for the first year. From the 'Late Interviews' stage, click the 'Hire' button for the candidate that has been hired. Once the 'Hire Feedback' box pops up you will be able to input the hire information. To ensure that records are accurate, hires should only be input when the formal processes have been completed (e.g. offer letter signed, background check completed). 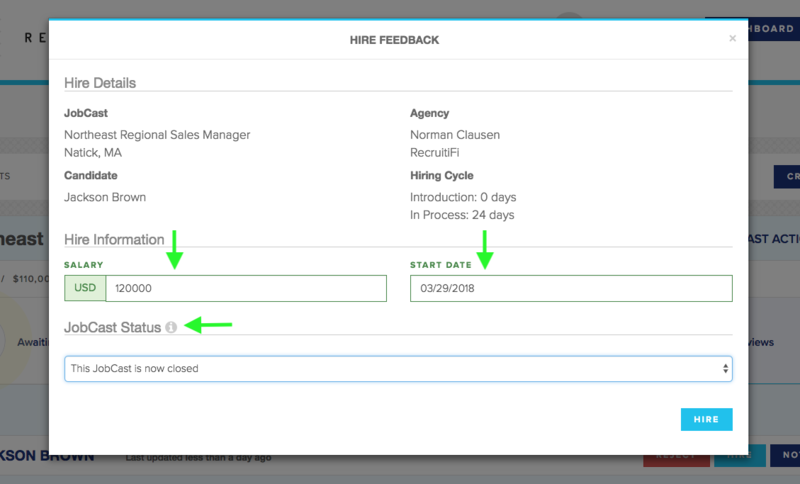 If you need to hire more than one candidate, or you plan on leaving the job open to hire additional candidates in the near future, you should chose to leave the JobCast open in the JobCast Status dropdown. With the JobCast still open, you can go back into additional candidate's profiles and select them for hire. Once a hire is logged, the submitting recruiter will receive an email notifying them of the hire and providing them with instructions on when the candidate clears the guarantee period, what they will be paid, and how to setup their payout preferences if they haven't already. Tags: make a hire, log a hire, hire information, hire details, hire feedback, start date, salary, JobCast status, close JobCast, hire multiple candidates.